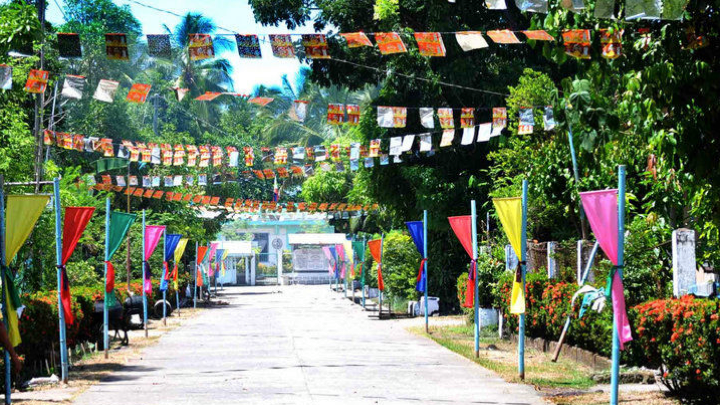 Every May 1st, Guinob-an would celebrate our barangay fiesta. This is a tradition in each town, and usually happens during the summer months when school is out, which for us means April and May. During these months, almost each week there is a fiesta in one of the barrios, which is very exciting, but the most exciting is when it’s your town’s fiesta. There was a parade, a basketball tournament among the barrios, beauty pageants, singing contests, and for two days there was food, glorious food everywhere. It was about this time that I became aware that there were some families in the town who had better houses; instead of being made from sticks and woven leaves, or plywood and corrugated roofing, they were cemento na balay—cement homes, built with hollow blocks. For many of these, I began to realize, the reason they were better off than the rest was that they had an “abroad”—meaning a family member working abroad. These “abroads” were fascinating to us; they were exotic, larger than life, exciting; they were our celebrities. During the time leading up to the Guinob-an fiesta, it was big news and exciting to hear which of the abroads were coming home for fiesta. The day that an abroad would arrive home was special. It was always by boat then; that was the only way to reach Guinob-an. Sometimes the boat would stop in Bolusao only but when they had enough passengers from Guinob-an, they would stop in Guinob-an and unload everybody there, on the rocks. When you knew somebody was an abroad and they were going to be on that particular boat, kids would be running to where they dock the boat just to have a glimpse of the people coming out of the boat to see who the abroads were. They were easy to spot; they would have actual suitcases; we didn’t have those. We didn’t know what they were. We would pay attention to how much baggage they would have, knowing that the more baggage, the more goodies they brought. We would follow along behind them on the walk to Guinob-an, and then when they got into their house, kids like me would hang around on the street, maybe hoping to get a handout of candy or just another glimpse of the mysterious and exciting abroad. Abroads were definitely different; they had better clothes, their skin was better, they looked lighter in complexion. The family seemed happy when they were in town; of course they were happy to see the abroad who had been away. However, there was also something else; an abundance. I began to think about it; it seemed that when somebody comes home from abroad, I felt like his family will be very happy for a while. Their loved one is there. The will be food abundant; everything will be easier for them because the abroad would bring money and pasalubongs and would make sure that the family was okay while they were there. I remember hanging out near the houses of the abroads, watching the excitement, and feeling very much on the outside looking in.